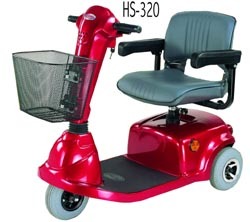 The New HS 320 3 wheel scooter - the Ultimate in style and affordability has arrived! The new HS320 is loaded with standard features such as front headlight, swivel seat, front basket and an infinity adjustable tiller. The HS 320 then combines this style and great feature package with smooth and quiet indoor operation as well as the power, range and stability needed for incredible maneuverability - offering you unparalleled overall value and performance! 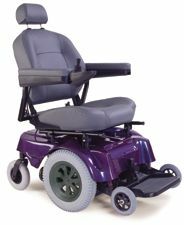 Wheel Size Front and Rear - 9"
Comfortable low back padded seat.